Place steak into a large bowl or gallon sized ziplock baggie. Place peppers and onion into another large bowl or baggie. In a medium sized bowl, whisk together TABASCO® Sauce, olive oil, orange juice, lime juice, soy sauce, paprika, cumin, onion powder, garlic powder, and salt. Pour half of the sauce over the steak and half over the peppers and onion. Cover or seal and place in fridge to marinate for 8 hours. Preheat oven to 450 degrees F and line a rimmed baking sheet with a silicone baking mat or parchment paper. Place steak onto prepared baking sheet and bake for 15 minutes. Remove from oven, add peppers and onions, and cook for an additional 15 minutes. Let steak rest for 10 minutes, before thinly slicing. Heat a large nonstick pan over medium heat. Place one tortilla onto a clean work surface. Top with 1/2 cup shredded cheese. Top with 1/6th of the steak, peppers, and onions mixture. Top with 1/2 cup more shredded cheese and then another flour tortilla. Cook in preheated pan, flipping halfway through, until the tortillas are golden brown and the cheese has melted. Cut and serve with optional toppings! Our most versatile sauce. Enliven the flavor of any meal. Looking to Partner with Us? 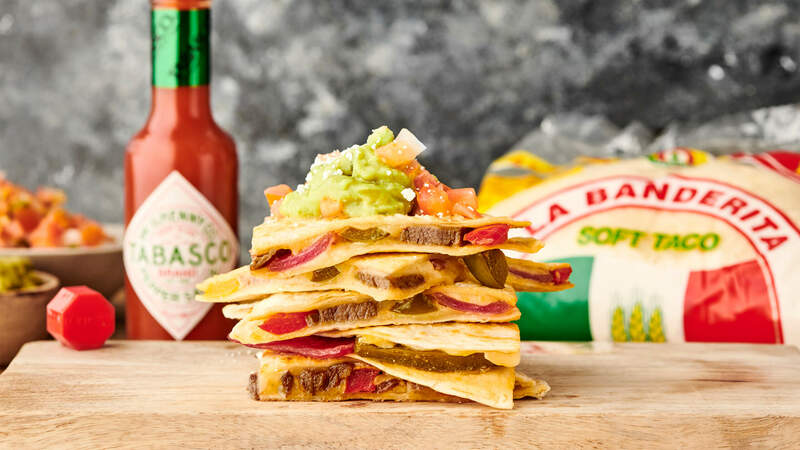 Spice up your business with a splash of TABASCO® Sauce. Head to our dedicated Foodservice website to learn more! Take it from us, everything is better with a dash of pepper sauce. Make them spicy and authentic. Score with winning food everyone loves! Recipes from south of the border full of flavor. Slow-smoked, hand-crafted pork dishes with a touch of TABASCO® Sauce.